Being the un-athletic American that I am, I’m sitting here writing this post with the 2012 Olympics tearing away at least part of my attention in the background. 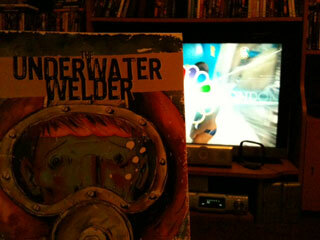 Specifically it’s the men’s diving and somehow I find that ironic as I write about my decision to buy Jeff Lemire’s Underwater Welder – a book that actually hit the shelves last week. I can’t explain why I haven’t read or bought this book until today. There really is no particular reason. It’s pretty darn indie, it’s creator-owned, it looks beautiful, it has all the makings of a book that I should already have given accolades too. All that and with the exception of being born Canadian, Lemire seems to have done it all correctly. He attended film school, received a Xeric Award, self-published and has worked his way up to mainstream books that I found interesting: Frankenstein, Agent of S.H.A.D.E. and The New 52 reboot of Animal Man. But sometimes, my not-so-all-seeing eyes miss things in the wonderful world of indie comics. So – Back to the diving for a little while so that I can feel better about being born American for a little while. But then it’s back to reading and writing about indie comic books. This entry was posted in Columns and tagged Agent of S.H.A.D.E., animal man, Frankenstein, Jeff Lemire's, men's diving, olympics, The New 52, Underwater Welder, xeric award. Bookmark the permalink. Follow any comments here with the RSS feed for this post. Post a comment or leave a trackback: Trackback URL.